As the summer ends and school starts up at West Virginia University, they will have two Falcons on campus looking to wrestle for the Mountaineer’s. That’s correct, both Landon Dean and Evan Oddenino have signed with West Virginia and are looking to participate in wrestling this upcoming year. Once again Fauquier wrestling is putting the hammer down sending wrestlers off to college to compete. West Virginia University is in the Morgantown, W. Va, is about 200 miles northwest of Washington, DC. Founded in 1867 it has a long and rich history competing in the NCAA as a Division I classification and recently has moved into the Big 12 Conference leaving the Big East. Landon comes off his senior year where he wrestled in the 145 classification and was a district champion, took third in Regionals, and eighth place at the AA States. He was a two year starter for the Falcons where he earned a 70-27 career record. 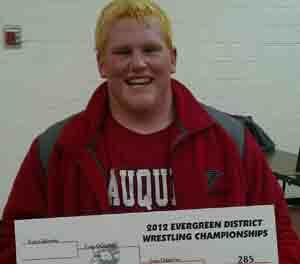 Evan was a starter for three years and wrestled heavyweight each of those years. 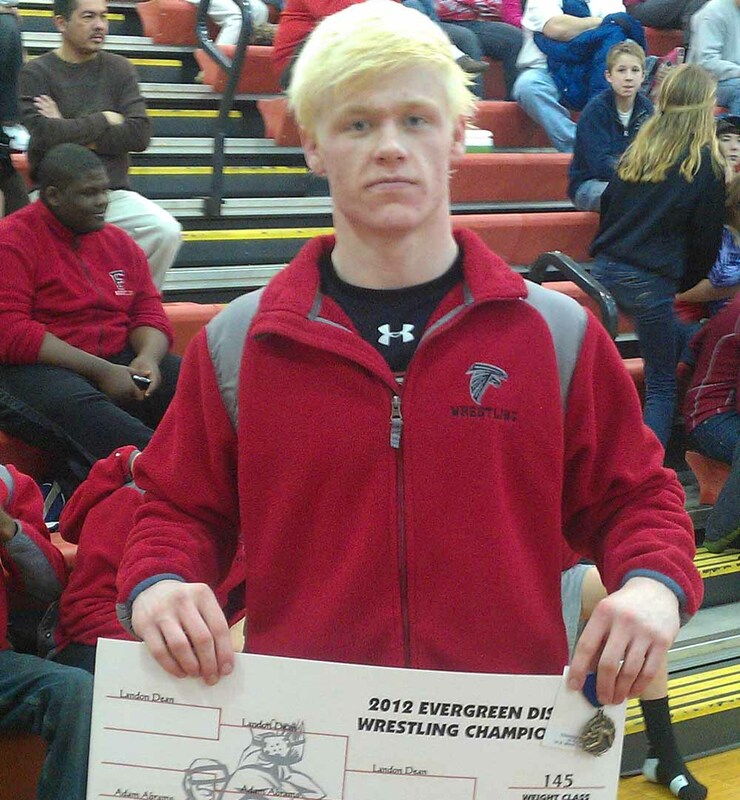 In his senior year he was a district champion, a Regional champion, and was an AA State runner-up. Evan completed his high school career with a 73 – 43 record. Q: Can you describe what it means to the wrestling program to have seniors leave for college and continue to participate in the sport of wrestling? Coach Fisher: Having seniors come out of the Fauquier Program and continue their wrestling career into college says many things. It showcases Fauquier as one of the top wrestling programs in the state as we continue to add wrestlers to the college ranks year after year. Those who move on to wrestle in college are adequately prepared with the wrestling skill set, mental toughness and discipline required for collegiate wrestling. In addition, it has been great to have some of our previous graduates who are still wrestling in college come back into the room this summer helping the next group of Fauquier standouts. These guys include Van Grimes (VMI), Chris Moon(Virginia Tech), Ryan Hunsberger(George Mason). Although he wasn't able to get into the wrestling room, Greg Flournoy (George Mason) was around this summer on the track and in the weight room rehabbing from knee surgery in preparation for this season. Q: As you look back at your High School wrestling career, what is one of your memorable moments? Landon: Making it to the finals of Virginia Duals and going undefeated the whole tournament. Evan: One of my most memorable moments was the state finals. Even though I didn't win, it was an awesome experience. Q: What made you choose WVU? Landon: Right when I stepped on the campus I knew it was the right place for me, and the wrestling coach seemed to be really cool. Evan: They have the major, sports and exercise psychology, I wanted to do. And I have some of my best friends here. Q: What are some short term goals this year at WVU? Landon: I want to win at least one match in a college tournament this season, and try to gain a lot of muscle. Evan: One is to do well in school and to get some mat time. Q: Any words that you want to express with regards to the Fauquier Wrestling program? Landon: It was one of the best decisions I had ever made in my life to stick it out and stay in the program, I made best friends that I will be close with forever, and I went through the some of the toughest years of my life that had changed me to see that anything is easy compared to wrestling for Fauquier, it’s a great program and anyone would be lucky to call themselves a Fauquier wrestler. Evan: Without the program, I wouldn't have been able to do well. So I give a lot of thanks to the coaches, wrestlers, and families who involved themselves in the program. Currently both Landon and Evan are roommates at WVA and are hoping to work hard in the wrestling room to improve on their game. As freshmen they will have a big mountain to climb to crack the starting line-up but their past work ethic within the Falcon program should weigh on their favor. But learning the song County Roads by John Denver will may have to occur first.